[S414] CD - Sth Australian Marriages, Sth Aust Index of Marriages 1842-1916, Book 238, p159. [S753] Australian BDM Indexes 1788-1950, at http://www.ancestry.com/, Sth Australia Births, Vol 161, p191. [S657] National Archives Film - Adelaide Nth Road Cemetery; microfiche. [S967] Vital Record - BDM California, marriage record, registrar co/number 07 206, state file # 7135. [S247] Government Publication - US SSDI, SSN 557-01-0404. [S190] Index - GRO and Office of National Statistics, England & Wales Civil Registration Qtrly Indexes, Birth: District of St George Hanover Sq, Vol 1a, p370, 3Q1875, mother's maiden name STONE. [S1044] Census - 29 Sep 1939, UK Register, RG101/1702C/005/37, Letter Code: DHIG, Schedule 41. [S190] Index - GRO and Office of National Statistics, England & Wales Civil Registration Qtrly Indexes, Marriage: District of Hackney, Vol 1b, p1139, 3Q1910. [S687] Census - 2 Apr 1911, UK census, RG14PN7197 RG78PN353 RD132 SD1 ED5 SN32. [S190] Index - GRO and Office of National Statistics, England & Wales Civil Registration Qtrly Indexes, Death: District of Dover, Vol 5b, p536, 4Q1946, aged 71. [S542] Index - New Zealand BDMs online, at http://www.bdmhistoricalrecords.dia.govt.nz/, Death Reg. No. 1983/36089 gives this birthdate. [S443] CD - NZ Marriages, CD - NZ Marriages 1836-1956 V2, NZ Registrar General's Folio 3592. [S542] Index - New Zealand BDMs online, at http://www.bdmhistoricalrecords.dia.govt.nz/, Death Reg. No. 1983/36089. [S190] Index - GRO and Office of National Statistics, England & Wales Civil Registration Qtrly Indexes, Birth: District of Fulham, Vol 1a, p257, 4Q1889, mother's maiden name ANGELL. [S923] BDM Registrar of New Zealand, death record, Reg. No 1980/28469, aged 90 gives this birthdate. [S443] CD - NZ Marriages, CD - NZ Marriages 1836-1956 V2, NZ Registrar General's Folio 7066. [S542] Index - New Zealand BDMs online, at http://www.bdmhistoricalrecords.dia.govt.nz/, Marriage Reg. No. 1912/8230. [S800] National Archives - NZ Archives (Archway), Items R6700736 & R22357198, Agency BBAE, series 4985, accession A48, boxes 634 & 652, records D264/1942 and D98/1943. [S923] BDM Registrar of New Zealand, death record, Reg. No 1980/28469, aged 90. [S778] Book - Brian Thomas Grenier, The Families of God's Acre, see Robinson family history associated with this cemetery. [S488] Index - Queensland BDMs (online and fiche), at https://www.qld.gov.au/law/…, Birth Reg. No. 1878/00353 Mb, p5703 to John Green and Catherine Dooley, both of Ireland. [S929] BDM QLD Registry, birth record, Reg. No. 1878/O353; daughter of John Green from Tipperary and Catherine Dooley from Westmeath. [S488] Index - Queensland BDMs (online and fiche), at https://www.qld.gov.au/law/…, Death Reg. No. 1923/B039471, p624, father John Green and mother Catherine Dooley. [S488] Index - Queensland BDMs (online and fiche), at https://www.qld.gov.au/law/…, Birth Reg. No. 1891/C4456, p9961 to Margaret Green, no father recorded and registered under the name of GREEN. [S488] Index - Queensland BDMs (online and fiche), at https://www.qld.gov.au/law/…, Birth Reg. No. 1892/B51210, p9962 to Margaret Lily Green, no father recorded and registered under the name of GREEN. [S284] Index - New South Wales BDMs online, at http://www.bdm.nsw.gov.au, Death Reg. No. 2240/1894, son of Friend W ROBINSON and Margaret. [S284] Index - New South Wales BDMs online, at http://www.bdm.nsw.gov.au, Birth Reg. No. 10581/1895, daughter of Frederick and Margaret. [S284] Index - New South Wales BDMs online, at http://www.bdm.nsw.gov.au, Birth Reg. No. 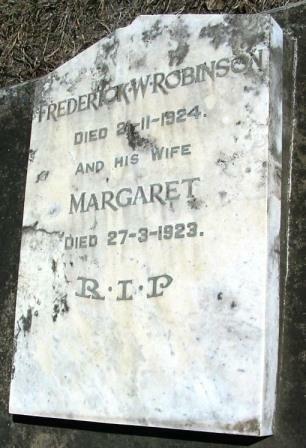 25260/1897, daughter of Frederick and Margaret. [S284] Index - New South Wales BDMs online, at http://www.bdm.nsw.gov.au, Birth Reg. No. 16919/1899, daughter of Friend W and Margaret. [S488] Index - Queensland BDMs (online and fiche), at https://www.qld.gov.au/law/…, Birth Reg. No. 1902/C9838. [S488] Index - Queensland BDMs (online and fiche), at https://www.qld.gov.au/law/…, Birth Reg. No. 1906/C9507, p22354 to Friend William ROBINSON and Margaret GREEN. [S488] Index - Queensland BDMs (online and fiche), at https://www.qld.gov.au/law/…, Death Reg. No 1957/B22627, p990. [S542] Index - New Zealand BDMs online, at http://www.bdmhistoricalrecords.dia.govt.nz/, Birth Reg. No. 1892/10753 daughter of Francis Edmund and Amy Anna Mary is a possible match. [S443] CD - NZ Marriages, CD - NZ Marriages 1836-1956 V2, NZ Registrar General's Folio 6257. [S542] Index - New Zealand BDMs online, at http://www.bdmhistoricalrecords.dia.govt.nz/, Marriage Reg. No. 1912/7925. [S542] Index - New Zealand BDMs online, at http://www.bdmhistoricalrecords.dia.govt.nz/, Death Reg. No. 1918/11217, aged 29. [S190] Index - GRO and Office of National Statistics, England & Wales Civil Registration Qtrly Indexes, Birth: District of Bradford Yorkshire, Vol 9b, p143, 3Q1899, mother's maiden name WILSON. [S262] Book - Rex & Adriene Evans, Faith & Farming, p369. [S312] Electronic Files - A Robinson, and subsequent correspondence, Daughter of John and Lucy GREENING. [S443] CD - NZ Marriages, CD - NZ Marriages 1836-1956 V2, NZ Registrar General's Folio 2762. [S542] Index - New Zealand BDMs online, at http://www.bdmhistoricalrecords.dia.govt.nz/, Marriage Reg. No. 1928/1990. [S542] Index - New Zealand BDMs online, at http://www.bdmhistoricalrecords.dia.govt.nz/, Death Reg. No. 1968/29654, supposedly aged 67(!). [S6] Newspaper - Times of London, Wednesday, Jan 22, 1908; pg. 14; Issue 38549; col E.
[S190] Index - GRO and Office of National Statistics, England & Wales Civil Registration Qtrly Indexes, Marriage: District of Kensington, Vol 1a, p236.